At Tibard, we sell a great range of Adidas products from polo-shirts to bags. Our Adidas polo-shirts are perfect for a relaxed workwear uniform and for sports teams and clubs. As with all Adidas apparel, our range offers great quality products. We sell a wide variety of Alexandra beauty and spa garments. Our Alexander tunics are perfect for creating a trusting atmosphere, with both the various styles and quality of Alexandra’s both employee and customer. We highly recommend purchasing a selection of theses fantastic garments to complement your working environment. Tibard has a large collection of Anvil clothing from T-shirts and hoodies to polo-shirts and caps. They are ideal for a more casual style workwear uniform or purely for leisurewear. Anvil’s T-shirts and polo-shirts are perfect for exhibitions, events or trips. Tibard’s range of AWDis Just Cool clothing is great for various relaxed workwear uniforms, sportswear or leisurewear. Our AWDis Just Cool T-shirts, vests and polo-shirts are ideal for sports teams and clubs. We also have hoodies and caps which are a great addition to any AWDis Just Cool outfit. Tibard offers a vast range of AWDis Just Hoods hoodies, zip ups and sweatshirts. They are available in a variety of vibrant colours perfect to suit your every need. AWDis Hoods hoodies are ideal for teams and clubs or school leavers. Their versatile sweatshirts can serve several purposes from a relaxed workwear uniform or simply for leisurewear or even to raise visibility for your organisation. Tibard’s AWDis Just Sub T-shirts and polo-shirts are the perfect solution for a permanent printed shirt. The crisp white fabric is durable enough to undergo the sublimation printing process producing a permanently printed T-shirt with fantastic detail in a colour of your choice. Tibard offers a wide range of products from B&C Collection. These products’ simple design and variety of colours have something to suit all tastes. Tibard offers a range of denim workwear from B&C Denim. The unique look of these products could give your business a truly distinctly styled uniform. Tibard offers a wide variety, styles and range of BagBase backpacks and satchels perfect for use as an additional uniform item or for personal use, corporate use and leisure. You can choose from many different styles and colours to suit you or your company. Our BagBase products are great for clubs and societies wishing to stand out from the crowd on trips away. Our BagBase drawstring bags are perfect for promotional giveaways at corporate events, tradeshows or exhibitions. From Kustom Kit, Bargear was specifically designed around the needs and demands of staff in bars, pubs and upmarket clubs. Bargear is a series of chic garments designed with the requirements of a busy bar with the versatility and quality of Kustom Kits other ranges. Tibard stocks a colourful range of Bella + Canvas T-shirts, hoodies and cardigans. If you’re looking for casual workwear then look no further. Our Birkenstock clog is perfect for complementing a professional kitchen uniform for chefs at a café or restaurant. They are also a popular option for spa and beauty uniforms footwear. Tibard sells a range of Brook Taverner corporate clothing. Brook Taverner’s collection of shirts, blouses, trousers and jackets is perfect for a workwear uniform to give you and your business the professional look you deserve. Tibard offers a great range of Craghoppers outdoor wear. Perfect for those seeking some top quality outdoor wear from one of the most respected outdoor brands on the market today. Tibard is glad to begin selling Crocs shoes including a special bistro clog, designed for use in the services sector with servers and waiters in mind. Crocs products are ideal for a practical work wear uniform for a wide range of small businesses like cafes. Tibard sells a range of Dickies clothing including high-visibility items as well as hard-wearing jackets, trousers and work boots. Dickies durable workwear products are ideally suited to a variety of practical work wear uniforms and reliable clothing for a wide range of industries and businesses. Tibard supply a range of Front Row’s heritage polos, t-shirts and shirts. They are perfect for a casual uniform suited to cafes, bars and relaxed restaurants. Tibard sells a range of Fruit of the Loom clothing which includes T-shirts, polo-shirts, sweatshirts and hoodies ideal for teams, clubs or societies. Fruit of the Loom products are great for a relaxed workwear uniform or a one-off event, tradeshow or exhibition. The hoodies are a perfect choice for school and college leavers or trips away. Tibard offers a range of Gildan clothing from T-shirts to sweatshirts. Gildan products are highly comfortable and functional yet stylish. The T-shirts and polos are perfect for a relaxed workwear uniform at events, tradeshows or exhibitions or for leisurewear. Gildan sweatshirts and hoodies are ideal for teams and school leavers. Tibard offers a smart range of shirts, trousers, shorts, fleeces and sweatshirts from Henbury. They describes their products as being classic, easy to wear styles for the modern corporate market. Tibard offers a range of James Harvest shirts and fleeces. Their extremely smart design will make you stand out from the rest. The formalwear is available in several different colours so be sure to find the one perfect for you. We sell a variety of Kariban. Much of kariban’s portfolio is perfect for a relaxed workwear uniform and for sports teams and clubs. They are great for one-offs such as a team trip away or a specific exhibition or event. Tibard sells a wide range of clothing for various scenarios. These include; customer facing staff, corporate wear and promotional wear. Kustom Kit provides a wide selection of ranges which include a variety of styles, fits, colours and functions. Our Kustom Kit polos and shirts are easily personalised using our precise embroidery capabilities. At Tibard we sell a range of Mozo non-slip shoes. We think they are a great addition to our catalogue because they are designed to be both stylish and also functional and durable. At Tibard, we sell a range of Nike products from polo-shirts to sports bags. Our lightweight Nike polos are perfect for the casual athlete or a local team sports club. They are great for a team trip away or a specific tournament or event. Tibard sells a range of Nimbus clothing perfect for sportswear, workwear or leisurewear. Our Nimbus collection includes a variety of fleeces, waterproof jackets and lightweight coats and jackets. Available in both men's and ladies. At Tibard, we sell a range of Oliver Harvey products from chef aprons to jackets. Our Oliver Harvey front-of-house aprons are the perfect uniform for your friendly and professional employees. They are the perfect choice for your brand new restaurant, your staff and customers are sure to love them. Tibard has a great variety of healthcare products from Orn. If you are looking for hardwearing and ethically sourced scrubs, tunics or trousers then Orn is perfect for you. Tibard sells a range of Portwest workwear including a variety of high-quality workers’ jackets fit for any industry and a range of outdoor, construction trousers. Portwest products are great for looking professional and are designed with specific industries in mind. Tibard offer a large variety of Premier clothing, including ranges from beauty and spa wear, to hospitality and business wear. The diversity of our Premier collection, means they are perfect for a number of different uniform styles. Match your brand image brilliantly with the huge number of different styles and colours with our Premier workwear. Regatta is the preeminent brand in the consumer-facing outdoor wear and countryside lifestyle market. Regatta takes pride in the fact that they provide a fantastic range of garments and accessories for practically any challenge you’ll face in the great outdoors. At Tibard, we sell a variety of Result clothing, mainly their prestigious Result Work Guard series. This range is designed to deliver high levels of added protection to you employees. Tibard sells a range of versatile clothing for your customer facing staff. The Russell Collection provides a wide variety of styles, fits, colours, functions. Our Russell Collection jackets and shirts are easily personalized using our precise embroidery capabilities. At Tibard, we sell a range of Shoes for Crews. Our Shoes for Crews slip-resistant footwear are perfect for a relaxed workwear uniform or for any employee who is always on the go. They are great for supplementing and safeguarding your employees. At Tibard, we sell a range of Snickers workwear products from Snickers including a wide range of durable trousers and jackets. Our Snickers trousers are perfect for an industrial workwear uniform and for dangerous and demanding onsite construction work. Stormtech is the preeminent name in storm and extreme weather protection wear. For over 35 years, this Canadian company has been continually improving their storm protective gear from classic thick and heavy jackets to the developments of new breathable fabrics and multilayer thermals. 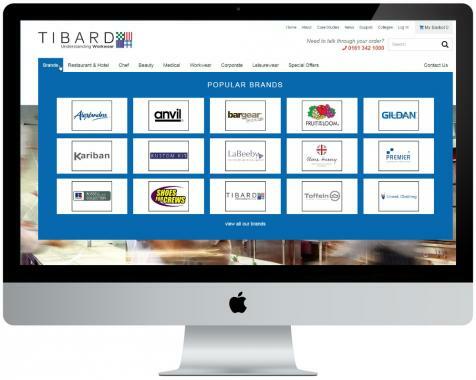 On this page you can view all of the products manufactured by Tibard directly. We specialise in producing a range of chef clothing and restaurant aprons along with a few other complementary products including waistcoats, tabards and waiters cloths. The majority of our chef uniform range, as well as our front of house aprons, is made in Great Britain at our Cheshire head office. Tibard offer a selection of WearerTech safety shoes, in a variety of different styles and colours. These clogs are a popular choice among those in the hospitality industry, in particular kitchen use, along with beauty and hair salons, and they are also often used to complete spa uniforms. Tibard offers a range of Towel City products which are ideal additions to spas and salons. There is a selection of towels of varying sizes and various applications, robes and other bath wear to suit your requirements. Towel City garments are sophisticated, stylish and will easily fit into your healthy and calm environment. Tibard sells a range Uneek clothing which includes T-shirts, polo-shirts, sweatshirts and hoodies ideal for teams, clubs or societies. Uneek products are great for a relaxed workwear uniform or a one-off event, tradeshow or exhibition. The hoodies are a perfect choice for school and college leavers or trips away. Tibard supply a large range of top brands from the workwear and uniform industry so that we can provide our customers with extensive choice and the perfect product to suit them. In fact we have over 2000 products in an incredible 80000+ sizes and colours from over 75 of the top workwear brands. This page will allow you to easily shop by brand; perhaps you have seen or bought workwear from a brand but cant remember the name of the products or maybe you know of a good uniform brand but arent sure on what you want - this page makes it easy to browse everything. Our large range of uniform and workwear brands (as well as some of the top casual clothing brands) include; Premier clothing, Dickies, Fruit of the Loom, Gildan, Adidas, Oliver Harvey and Alexandra Uniforms. We have brands that cover a very wide range of products and industries including beauty wear, hotel uniforms, restaurant uniforms and industrial workwear, some of the brands we supply have a range of products that cover multiple industries - Premier Clothing is one of our favourities for the sheer flexibility of their range! We have of course included ourselves in the list of brands because as you know, we make some of the best value and long lasting chef wear and most of it is made here in the UK. Remember though, as we have our own manufacturing facilities in Cheshire, we can make anything that you require on a bespoke basis, so we have only listed our standard items here. To have your very own items designed and made by Tibard, check out our information on bespoke uniform design. We have introduced tailored brands pages onto our website, making finding your favourite brands much easier. Hover over 'Brands' in the navigation menu to see our 15 most popular and a link to the full list.